Nailing a completely balanced diet every day, one that contains the full spectrum of essential and non-essential vitamins and minerals alike, would be amazing. It would be even better if everyone did that. In that case, the often-quoted but little understood claim of many “gurus” that a vitamin supplement is unnecessary would be correct. But that’s not the case, not at all. In fact, research shows that most people – yes, even you, the fit person reading this – do not eat a balanced diet. Many people lack critical nutrients from their diet, either by absence (not eating them at all) or by over- or under-consuming other trace minerals or vitamins necessary for the original vitamin’s homeostasis. The result, in either case, is a vitamin and mineral environment that could and can be optimized. The result is a formula not only with 100% (and often more) of almost all your essential vitamins and minerals, but also a broad-spectrum antioxidant blend antioxidant blend (Spectra™), berberine HCL, and numerous trademarked forms of vitamins and minerals. 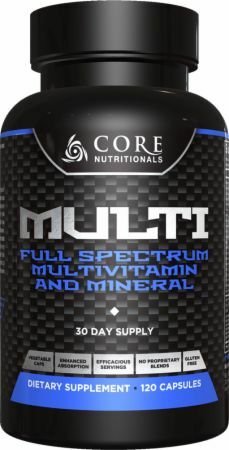 If you need a broad range of essential vitamins and minerals in sufficient amounts and in the most efficient forms, then Core MULTI is for you. Percent Daily Values are based on a 2,000 calorie diet. **Daily Value not established. Rice Flour, Magnesium Stearate, Microcrystalline Cellulose, Hypromellose, Silicon Dioxide. Directions For Multi: Take 4 capsules daily with food. Warnings: This product is only intended for use in healthy adults 18 years of age or older. Pregnant or nursing women should not use this product. Consult your healthcare provider before using this product, especially if you are taking any prescription, over the counter medication, dietary supplement product, or if you have any pre-existing medical condition including but not limited to: high or low blood pressure, cardiac arrhythmia, stroke, heart, liver, kidney or thyroid disease, seizure disorder, psychiatric disease, diabetes, difficulty urinating due to prostate enlargement or if you are taking a MAOI (Monoamine Oxidase Inhibitor) or any other medication. Discontinue use and consult your health care professional if you experience adverse reaction to this product. Discontinue use 2 weeks prior to surgery. Do not exceed recommended serving. Do not use if safety seal is broken or missing. Keep out of reach of children.